On a wet Saturday afternoon at Croft Park Blyth Spartans put on a complete performance to beat Leicestershire-based Barwell 4-0. The home side made one change from the previous week’s superb 2-0 win at Marine, with Matthew Wade coming in for the injured Damen Mullen who had been in fine form and won the November Player of the Month award. Blyth started the better and the first chance came after five minutes for midfielder Michael Richardson after a through ball from Daniel Maguire, but his shot produced a good save from Barwell goalkeeper Liam Castle. The visitors’ first chance came from Alex Tomkinson after he intercepted defender Danny Parker’s pass, drove forward but his shot from 20 yards went narrowly past Fabian Otte’s right hand post. A minute later and a good first time pass from skipper Robbie Dale found Richardson whose threatening cross was mis-kicked by a Barwell defender and found Maguire but the shot from the forward was tipped wide by Castle. Barwell began to push forward and a cross from Tomkinson found Owen Storey who had an ambitious shot which went wide. Blyth were the better of the two teams and a ball to the left from Stephen Turnbull found Maguire and his effort brought another good save, this time by from Castle’s right foot. As Spartans applied the pressure the first goal came on 26 minutes when a fantastic shot from Sean Reid from 30 yards out flew past Castle. Four minutes later and a superb 40-yard diagonal ball from Dale found Maguire but his pass could not pick out Richardson on the right. Barwell forward Jamie Towers had a right foot drive which forced Otte to make his first major save of the game, and fortunately for Blyth there was no one on hand to follow up. The visitors had a goal disallowed from forward Anthony Carney after referee Michael McDonough spotted a foul on Otte, and five minutes before half-time Barwell had an appeal for a penalty after Carney went down after a challenge from Parker. Referee McDonough waved away the protests and a minute later Storey fired wide. Blyth came out firing on all cylinders after the break and three minutes in a ball from Reid found Richardson and the former Newcastle U21 man calmly slotted past Castle for his fourth goal in his last four games to give Spartans a 2-0 lead. Within two minutes of extending the lead, a long ball from Barwell’s Isaac Cooper found Brady Hickey, who was on trial with Premier League Leicester City a few weeks ago, but he placed a shot just over the bar. But in the 54th minute a clearance from the Barwell defence only went as far as Parker who stabbed home his second of the season following his goal at Colwyn Bay in October to send Croft Park into raptures and giving the hosts a commanding 3-0 lead. Eleven minutes later the impressive Reid netted his second of the game after breaking the offside trap and slotting past the advancing Castle, to the protests of the Barwell defence, to put Blyth 4-0 up. Spartans were still on the offensive and a lovely switch ball from substitute Paul Robinson found Dale who ran on before unleashing a thunderbolt from 20 yards but it hit the top of the crossbar and went out of play. Credit to Barwell, who were seeing the game slip out of their grasp in the latter stages, but still midfielder Hickey was well placed to receive the ball on the edge of the box, however, his shot was well blocked by Ryan Hutchinson. Blyth were so close to a fifth just before injury time when Alex Nicholson shot wide of Castle’s right hand post. Blyth are now five points ahead of second placed Nantwich Town, who have one game in hand, and eight points ahead of Salford, who have one game in hand, and Workington, who have played the same number of games as the Spartans. Spartans travel to Frickley Athletic this Tuesday knowing that a win will give them an eight-point cushion at the top of the table and a more than healthy position going in to the Christmas and New Year fixtures. 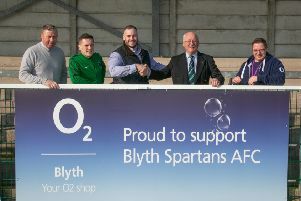 Blyth Spartans: F Otte, A Cartwright, (A Nicholson 71), J Watson, D Parker, R Hutchinson, S Turnbull, (N Hooks 76), M Richardson, S Reid, (P Robinson 68), D Maguire, M Wade, R Dale. Subs not used: D Morse, A Wearmouth. On Saturday, Spartans entertain Stourbridge at Croft Park. Kick-off 3pm.